…Like fishing. 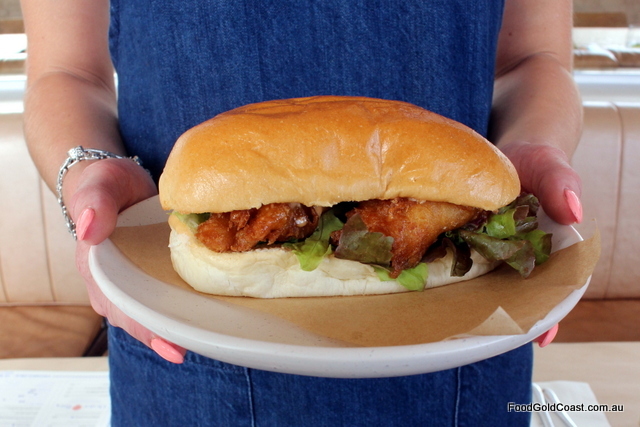 It takes patience to catch a fish, prepare and sometimes to eat seafood, especially crustaceans. 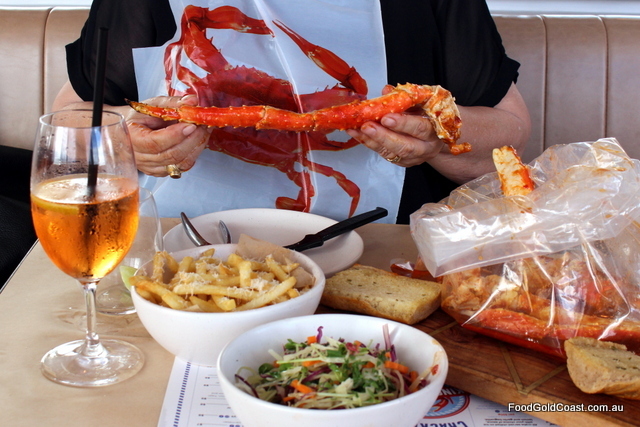 When that sweet crab flesh glides over my tongue, when that bite of Singapore chilli tingles my tastebuds, I smile and nod, knowing that the wait for King Crab Co has been worthwhile, that this venue is perfect for this location. In prime waterfront position in Marina Mirage overlooking the marina and Broadwater beyond, our dining table is almost close enough to cast a line. 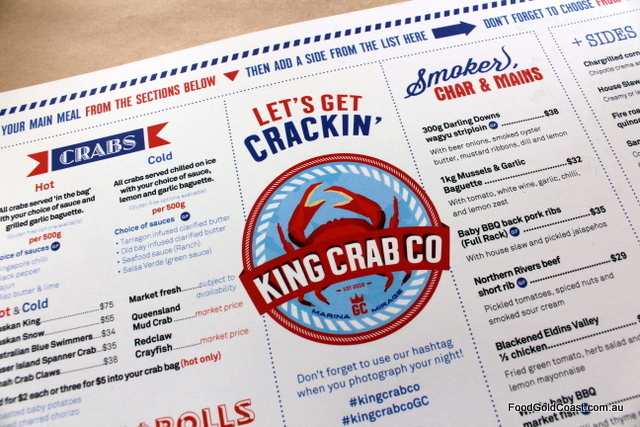 There’s a casual beachy feel to King Crab Co that’s completely welcoming. It speaks holidays at the coast: a long marble bar taking pride of place as its central hub, sea-light pendants shining down on paper-clad tables, sandy limed floors offset by accents of ocean blue on cushions and striped awnings that hold back the sun. Stretching over three levels, there’s even outside dining for sun lovers. Santorini at the Goldie, here we come! 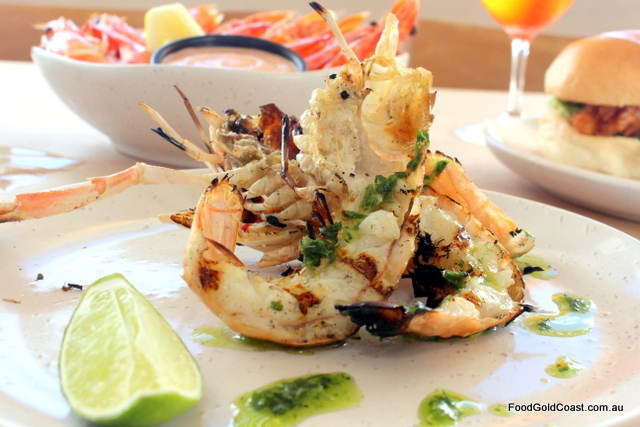 Unsurprisingly, seafood is the focus of the menu, an extensive single page laden with a weight of exciting choices. It’s even more exciting when we realise the focus on local product: Queensland mudcrab, Fraser Island spanner crab, Darling Downs wagyu, Northern Rivers beef, local trawler prawns. 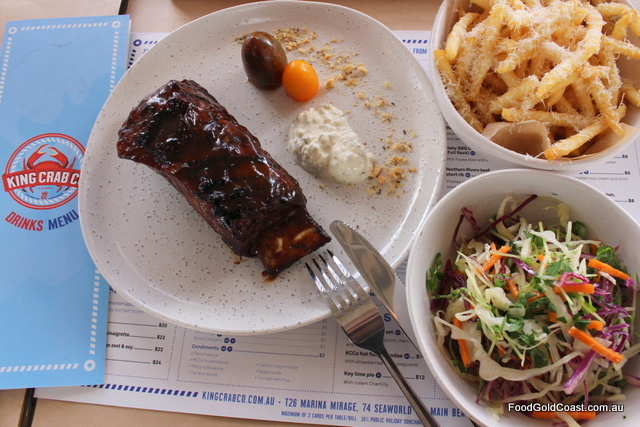 Thoughtfully sourced, and tweeked from their other Bulimba restaurant, this is a menu all our own. Joy of joys! We could fill up on cold and hot starters such as oysters, ceviche, crab cakes, or a softshell crab burger before we even embark on main courses of chowder, black lip mussels or BBQ fish of the day. 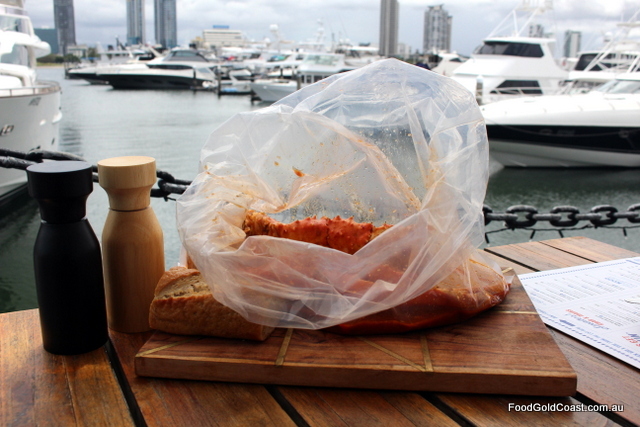 Then there’s the crab menu; the glory dish, where your crab of choice (at least seven types) is presented in a bag. And just in case you thought that seafood was the only star, the other half of the menu is rounded out with beef, chicken, vegetarian, with all dishes clearly marked for their vegetarian and gluten-free status. A main of Northern Rivers short rib (yes, it’s only one but it’s huge) leaves lingering tastes of smoky meat, tender and delicious. House slaw and truffle fries from the side menu provide picking territory before the star arrives, its long legs peeking out of the bag. Alaskan King Crab in a Singapore chilli sauce is a taste sensation – one of the best ‘friendly’ chilli sauces we’ve tasted, its depth of flavour still leaving room for the crab to shine. Suitably priced for such a luxury item ($75), it’s sheer messy delight, aided by the supplied tools of the trade, clothes and hands shielded by bib and gloves. If my life depended on my crab picking skills, however, I’d be thin! It’s for the convert, the patient ones, not for the faint-hearted, and we need a lesson from Karl, the restaurant’s co-owner before we achieve success. I can see us enjoying many meals at King Crab Co. We probably won’t be as indulgent on every visit but, as we’re mostly pescatarian, we’re partial to a 1kg pot of mussels of an evening, a fresh Katsu fish sandwich with tartare for lunch, some great seafood chowder topped with crab in winter, Beer-battered market fish and chips or even a Surf & Turf burger (all $17 – $25) on a busy night. 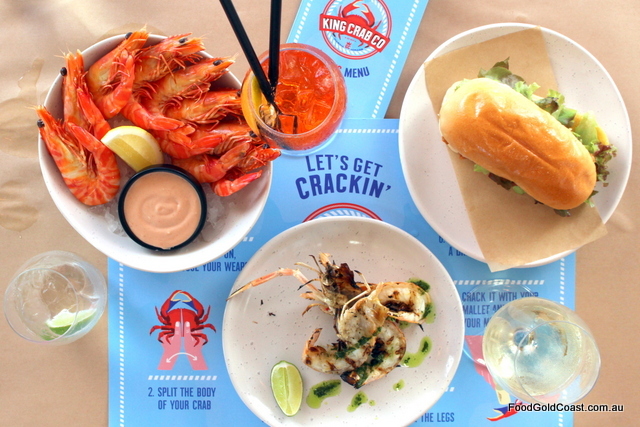 With a stunning view, classy cocktails, and well-priced dishes, King Crab Co is highly accessible to a range of diners and occasions, from everyday dining for families and tourists to an indulgent Sunday lunch or special occasion. You’ll be served like a king…and the crab is waiting! Don’t let it be the one that got away. 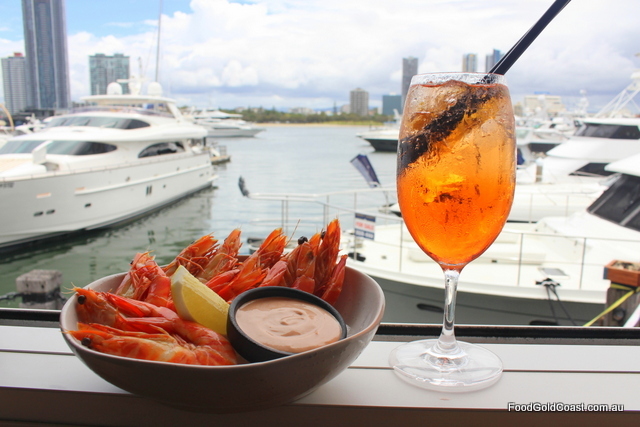 NOTE: Good Food Gold Coast dined as a guest of King Crab Co.